soothing the body and mind. purifying environs n provide shadow. and what u bestow is unparalleled. The picture has the neighbor's Neem tree outgrown into our courtyard. 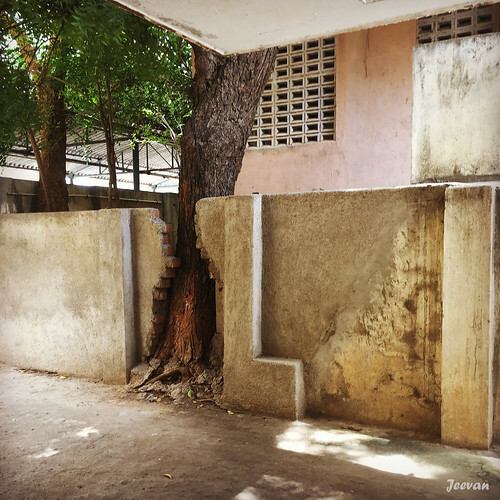 The neem tree cracked down a part of the wall and it was rebuilt leaving space for neem. Lovely to see nature and man in harmony. Your verse is so great. Make room for the tree as it does give so much to the earth. Great shot of harmony of nature and people. That neem tree must be an important tree! Good to know that neighbours do not fight over the tree and the broken wall. Neem tree is beautiful with small leaves. It is good that you have it. The breeze is good for health! What a powerful picture and poem to match it. As if to say, there's no need to put a fence here, we are not divided. Well done. A tree with such great gifts for all of us. Nice find, capture and share, Jeevan!